See the Royal Botanic Gardens through ancient eyes on this guided walk, learning about local food and healing, sharing stories and wisdom. Womin djeka! Journey into the ancestral lands of the Koolin nation and explore their rich and thriving culture. With your Aboriginal guide you will experience a traditional smoking ceremony and discover traditional uses of plants for food, tools and medicine. Develop an understanding of, and respect for, the customs and heritage of the local Boon Wurrung and Woiwurrung people. The Aboriginal Heritage Walk won an award for face-to-face interpretation and is also a Victorian Tourism Award winner. The Aboriginal Heritage Walk starts at 11:00am from the Visitors Center where you will be greeted with a warm welcome by our indigenous guide. The experience commences with a traditional smoking ceremony introducing the thriving culture and rich history of the Koolin nation. 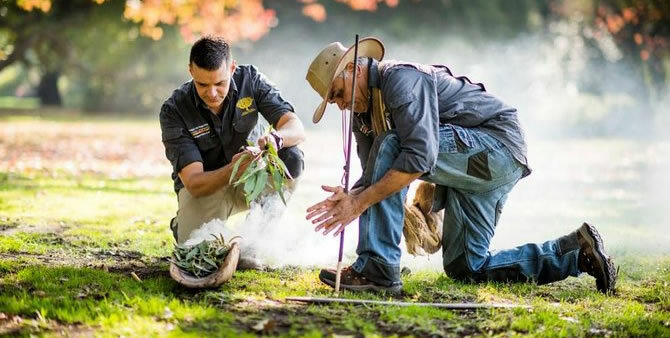 Embarking on a exploratory journey through the beautiful oasis of Melbourne's Royal Botanic Gardens this sensory experience shares the connection of Indigenous culture to plants, and trees and their traditional uses for foods, tools and medicine. The tour concludes with a warm Lemon Myrtle Tea in a pristine landscape setting whilst your aboriginal guide shares further stories and reflects on the cultural significance of Indigenous Australia. Guests are required to check-in at the Visitors Center situated next to Jardin Tan restaurant.